The doors to the Scioto County Courthouse on the Seventh Street side will be locked starting Jan. 1, 2019 for security purposes. All visitors at the courthouse will be asked to enter and exit on the Sixth Street side of the building. Big changes are coming to the Scioto County Courthouse beginning in 2019. According to Scioto County Commissioners beginning after January 1, magnometers and security personnel will be stationed at the 6th Street entrance of the courthouse. The 7th Street entrance will serve as an emergency exit only, requiring all traffic into the courthouse to go through the security check station. To man the two lines of security checks at the building’s entrance, one full time and two part time employees will be hired through the common pleas court in addition to a deputy sheriff who currently provides security for the facility. These changes are just a portion of the new security measures being implemented at the Courthouse. A safety grant from the State of Ohio has been applied for in the amount of $140,000 which is expected to allow for even more security improvements throughout 2019. One improvement the grant would eventually allow is a system much like that in operation at SOMC which would provide employees with a badge which would permit them to bypass the security check. Davis said these improvements were suggested by the courthouse Safety Committee, composed of employees from different offices and departments, and stated there will be meetings in the upcoming weeks briefing employees on all the new security measures in order for the transition to go as smoothly as possible. Security staff is expected to be in place at 7:30 am in order to accommodate the incoming employee traffic. “We’ll adjust as we can as we go along. We know there will be some complaints as we’re getting adjusted to the new measures in place,” said Davis. Commissioners stated they are unsure at the moment if the courts will choose to continue use of their magnometers which currently reside on the upper floors as an addition to the new security measures. Commissioners also mentioned some changes in parking are expected to come along with the closing of the 7th Street entrance, and stated an announcement regarding such will be made in the near future. “Other courthouses do this, we can do it too. We’ll make it as convenient for the public as possible, but public safety, and not just public but the safety of personnel in the building are paramount in our thoughts so we have to take the necessary measures and procedures to do that,” said Davis. 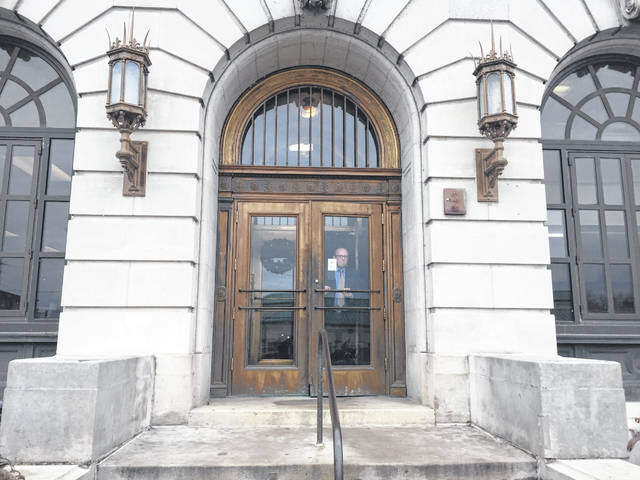 https://www.portsmouth-dailytimes.com/wp-content/uploads/sites/28/2018/11/web1_Entrance.jpgThe doors to the Scioto County Courthouse on the Seventh Street side will be locked starting Jan. 1, 2019 for security purposes. All visitors at the courthouse will be asked to enter and exit on the Sixth Street side of the building.